SCARBOROUGH MP Lawrie Quinn out-foxed hunt protesters who attempted to confront him about the ban on hunting with dogs. Mr Quinn was on a VIP trip on the North Yorkshire Moors Railway when dozens of hunt protesters attempted to confront him at Pickering and question why he had voted in support of the ban. He stayed in the catering car as protesters waited for him on the station. Some visitors to the steam railway also clashed with the demonstrators saying their day out had been spoiled. Sinnington Hunt member Mary Holt lay on the train tracks at Newton-on-Rawcliffe and riders got on to the platform on Saturday. 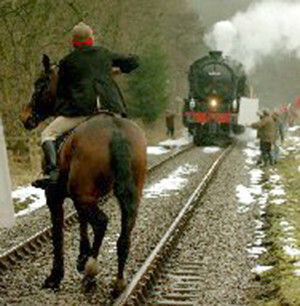 Three hunt horses were spooked when the driver gave a prolonged whistle to clear the line as protesters on horseback stampeded on to the tracks. Police were out in strength as the carriages pulled into Pickering station. It was thought Mr Quinn had got off the train during a 30-second stop before it arrived at Pickering station. Mr Quinn said he was in the catering carriage of the train while members of supporters of the Derwent, Middleton, Sinnington, Glaisdale and Saltersgate Hunts armed with eggs and banners staged their protest. Note: Ivan Richard Holmes, a Glaisdale Hunt member, tried to halt the train as he stands in the middle of the track on his horse. Hunt supporters from the Derwent, Saltersgate, Sinnington, Middleton and Glaisdale hunts lined the track.